(Nanowerk News) Rice University researchers have developed gas biosensors to "see" into soil and allow them to follow the behavior of the microbial communities within. 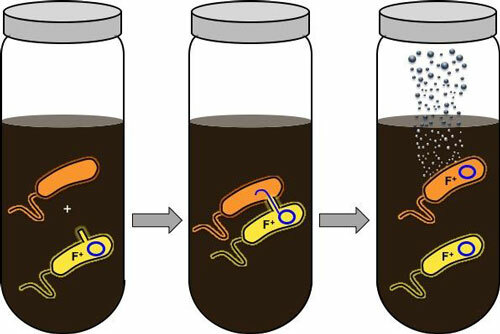 In a study in the American Chemical Society's journal Environmental Science and Technology ("Volatile gas production by methyl halide transferase: an in situ reporter of microbial gene expression in soil"), the Rice team described using genetically engineered bacteria that release methyl halide gases to monitor microbial gene expression in soil samples in the lab. The bacteria are programmed using synthetic biology to release gas to report when they exchange DNA through horizontal gene transfer, the process by which organisms share genetic traits without a parent-to-child relationship. The biosensors allow researchers to monitor such processes in real time without having to actually see into or disturb a lab soil sample. The Rice researchers expect their technique will serve the same purpose for environmental scientists that fluorescent reporter proteins serve for biochemists who track protein expression and other processes in biological systems. The work by the Rice labs of biogeochemist Caroline Masiello, biochemist Jonathan Silberg, microbiologist George Bennett and lead author Hsiao-Ying (Shelly) Cheng, a Rice graduate student, is the first product of a $1 million grant by the W.M. Keck Foundation to develop gas-releasing microbial sensors. "This paper describes a new tool to study how microbes trade genetic material in the environment," said Masiello, a professor of Earth science. "We care about this because the process of horizontal gene transfer controls a lot of things that are important to humans either because they're good -- it's how rhizobia trade the genes they need to fix nitrogen and support plant growth -- or they're bad -- it's how bacteria trade antibiotic resistance in soils," she said. "It's been much more challenging in the past to construct models of this dynamic process in real soils and to study how horizontal gene exchange varies across soil types. We've created a new set of tools that makes that possible." The researchers expect scientists will use gas biosensors in the lab to study nitrogen fixing in agriculture, antibiotic exchange in wastewater treatment, gene transfer in conditions where nutrients are scarce and the relationship between gene expression in soil and the release of greenhouse gases. "There are other technologies that will build on this," said Silberg, an associate professor of biochemistry and cell biology. "The idea of using gases opens up most anything that's genetically encoded. However, we do need to improve technologies for some of the subtler kinds of questions." He said releasing and sensing methyl halide gas represented an easy proof of concept. "Now we want higher-resolution information about other types of biological events by creating more sophisticated genetic programs using synthetic biology," Silberg said. They expect they will soon be able to test agricultural soil samples to help fine-tune crop growth through more efficient watering and fertilizer use. "How can agriculture get this extra level of efficiency without the waste? Lots of people are coming to that, and there are lots of ways to do it," he said. "We're trying to build high-tech tools that allow us to understand mechanisms to make reliable predictions. That's the long game with these tools." The researchers emphasized that these are tools for soil studies within lab environments. The synthetic microbes are destroyed once the results are obtained. The Rice lab tested soil samples from the National Science Foundation's Kellogg Biological Station Long-Term Ecological Research Site in Michigan after adding Escherichia coli bacteria programmed to release gas upon transfer of their DNA to another microbe. Signals from the gas were up to 10,000 times the lab's detection limit. The gas sensors were effective in anoxic -- or oxygen-depleted -- conditions, unlike green fluorescent protein, which requires oxygen to work. It is anticipated the reporter proteins can be used in many kinds of soil microbes, and some are currently being tested, Bennett said.